I thoroughly enjoyed this video and it is well worth watching. The outcome flies in the face of some conventional logic but supports the view that we have come to know and love in Agile. Spoiler Alert: for those that don’t watch the video, the premise is that The Federal Reserve bank in the USA commissioned a study in how to motivate staff and get better productivity, essentially how big a bonus do you need to give to have an impact on productivity. The study was carried out by scientists at MIT, Carnegie Melon and University of Chicago and the outcome will surprise some of you. Essentially what was classed as small or moderate incentive bonuses had no noticeable impact on productivity when applied to any task that wasn’t purely mechanical. And large bonuses (equivalent to 3 months wages) caused a measurable decrease in productivity. Yes that is right, give someone a significant incentive when working on even mildly cognitive tasks and they got worse. In other words incentives are bad, very bad. It should be noted that for the study to reach the conclusion ‘salary’ had to be off the table, people need to be paid enough as a base salary for that not to be a motivating factor. This is easier said than done. What I find interesting is that this study also supports old-school psychology too. 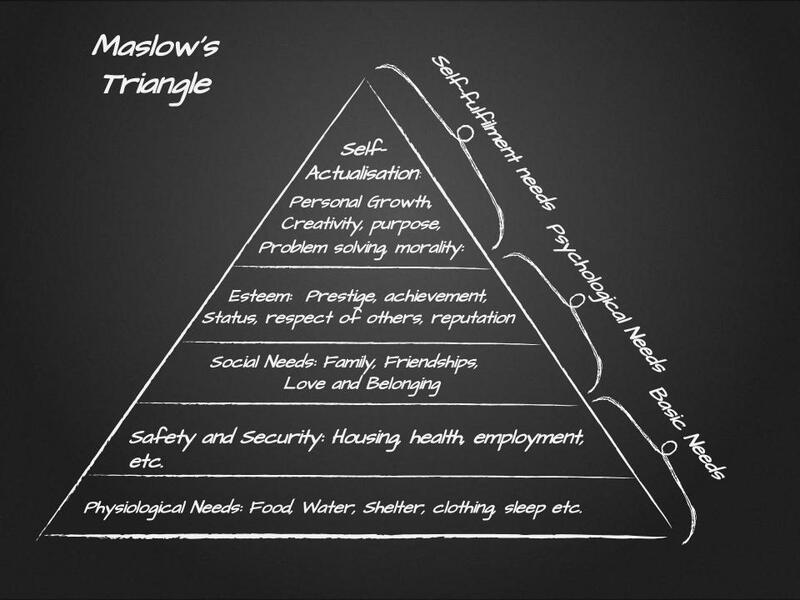 Some of you may be familiar with Maslow’s hierarchy of needs. Essentially once basic needs are met, security housing food etc. which have a direct correlation with income, things get more fuzzy, needs above essentials no longer have a direct monetary driver. We get into Psychological needs: areas of personal relationships, social standing, and then on to our need for self-fulfillment, creativity, fun, personal achievement. All of which have an element of financial impact but it is clearly it is not the primary driver. Once Basic needs have been met money becomes far less important to us. For example we don’t learn a musical instrument for financial benefit, or do a crossword, many of us have a hobby that takes huge amounts of effort, research, expense and often inconvenience and usually for nothing. Some participate in PTAs or Churches or social groups and clubs, or even write a blog. For most people money simply doesn’t drive us (Assuming we have enough to live), it is an enabler. So in theory if you have a reasonable base salary and you are content, then motivation needs to come from elsewhere. Money cannot buy happiness, but being broke sure makes you miserable. A company in the USA read a similar study and concluded that if someone earned $70,000 they would have enough to be content, all essential needs would be met and so money would not be a factor and they could focus on productivity, so he raised the pay of all employees to $70,000. Perfect! Only it wasn’t, humans are contrary soles and whilst the pay raise was great for some, we also measure our social standing by income, not because we care about income, but because it is a measurable metric of your value in society (or at least the workplace). So when someone you felt was in a job that required less skill or less status than you was suddenly earning the same you felt disgruntled, your salary hasn’t changed, last week you were happy but today you feel you are relatively less important. So it is about money and at the same time not at all about money. Paying fairly doesn’t mean pay them all the same. Laszlo Bock from Google in his book Work Rules goes even further than this:- he says to deliberately pay unfairly, if you have a good employee pay them excessively, deliberately take money out of the equation. Pay your staff well, pay them what they are worth as a base salary and review it regularly, but do not include any performance based incentives. And if you include profit share or Christmas bonuses, apply them equally (% based) and do not have them performance driven. What you want is a secure workforce, you do not want them to be thinking they could earn more elsewhere, and you do not want high turnover of staff. Show your employees that you truly value them, pay above market rates to ensure stability, and be prepared to pay exceptional employees exceptionally.